I have had some decent burgers in my time. 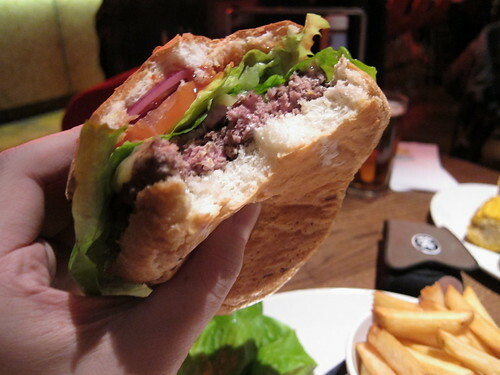 Lucky enough to have a cousin who lives in New York, I have fond memories of a burger I had at a bar called JG Melons, as well as the burgers I ate on my recent visit including Shake Shack and the BLT burger. London isn't doing too badly either, with Byron leading the way and other pretenders such as Hache trying to muscle in. After a conversation on twitter with @catty regarding the mediocrity of the burger at Ed's diner, @giraffetweet threw down the gauntlet, claiming that the burgers at Giraffe (a growing chain of restaurants selling "world food") were "the thing that (burger) dreams are made of". Having staked her claim with such conviction, I couldn't turn down a chance to try this "Godly" burger. Invite accepted. I had arranged a man date to go and see Avatar with the Captain, so a trip to Giraffe before hand slotted nicely into our schedule. Having grown up with him, where all I remember him eating were burgers, I thought he would be as good a judge as anyone to see if these burgers really made the grade. After all, it was him who first introduced me to Byron. Starters ordered, there was a slight mix up when the chicken potstickers turned up instead of the chicken tikka sticks. Not really an issue as the potstickers were pretty tasty, as well as the hummus we ordered on the side. None of this really mattered though, we were here for the burger and the time was nearly upon us. Bun - Good. Not brioche, nor ciabatta but a simple toasted white roll. Good flavour, slightly sweet and most importantly, survived the break up test. Burgers are meant to be eaten with hands, and after considerable man handling, stayed in one piece until the burger had been polished off. Big tick. Fillings - Never a fan when it comes to tonnes of veg in my burger. 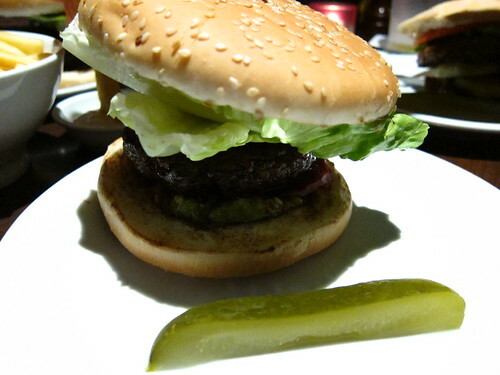 The burger I had at Eagle bar and diner (see above) annoyed the hell out of me as the lettuce kept poking me in the eye. However, I do like a bit of pickle and a good relish and this had both. In fact, the relish deserves a sentence on its own, sweet and tomatoey and I would happily take a jar of this home for consumption in my own abode. Patty - So here we go, the patty. Ordered medium, it arrived more on the side of medium well. So slightly over done but full credit to the patty. It was moist and very tasty. I should really have asked more info about the provenance of the meat, but as I discovered in the US, you don't always need to use the finest ingredients to make the best tasting burger. Big patty, big flavour and I was certainly pleasantly surprised. So overall, I was very happy with the burger. It certainly didn't let me down in terms of quality or flavour, but at £9.25 (compared to just £6.25 at Byron), I would say that it was a tad on the pricy side (although it was accompanied by fries). It's certainly streets ahead of other burger pretenders such as gourmet burger, ultimate burger, hamburger plus and I would even hasten to add Hache to that list. 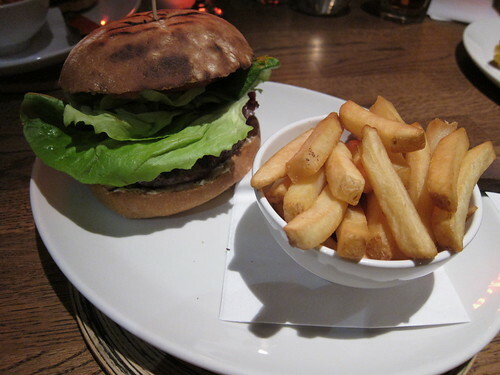 However, although this was very good, I still believe Byron serves the best burger in London, for flavour and value. I would happily come back here and have another. Even the Captain, a dedicated meat eater, was rather pleased. 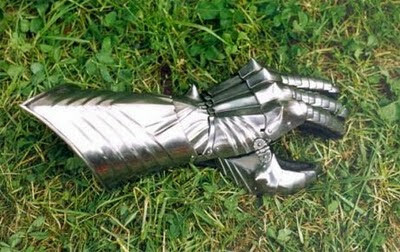 Gauntlet picked up and passed back to Ms @giraffetweet and point proven. You certainly are the proud owner of an excellent burger. Am loving the dedication to the cause - you will track down the best burger! 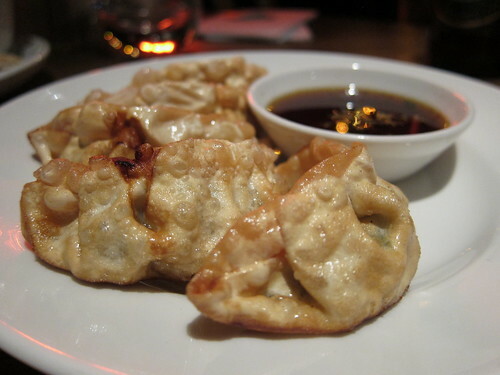 Hello Chinaman - I enjoy reading your blog a lot! 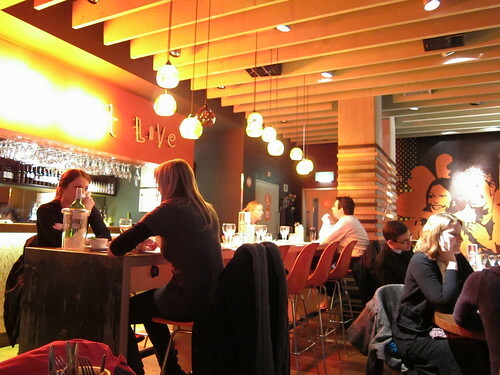 Tonight I went to 'My Old Place' near Liverpool St (as reviewed in the Guardian newspaper yesterday - see http://www.guardian.co.uk/lifeandstyle/2010/jan/16/my-old-place-london-review) - I really enjoyed it and think its a great place for slightly larger parties. Have you been and what did you think? Are you going to review it (or keep it a secret!!)? I would be interested to hear what a Chinese person thinks (I am not, but most people there tonight were so its obviously popular with the community). Thanks! Interesting...I've been to Giraffe before but have not yet had their burger. I know many bloggers don't agree with me, but I think Hache is the best burger I've had so far in London despite some of its oddities. I will have to try the orange and black striped burger now! Firstly, I LOVE your lead photo. That's fantastic. Secondly, your line about the lettuce poking your eye out...also fantastic. Honestly, 2nd best scrambled eggs I've ever had in my entire life were at the Giraffe in Spitalfields. Whoever was behind the stove that day knew what they were doing! @50decs - Thanks and My Old Place is on the list. @LF - I didn't think Hache was all that and it wasn't just the bun. The arrogant staff put me off my food beyond all belief. @Krista - I certainly think Giraffe has a lot going for it although my faith in the chain has not always been there. This burger is definite cause to give other things a try.